This year’s 2012 Rare Finds auction gala for the Rare Disease Foundation was a blast! 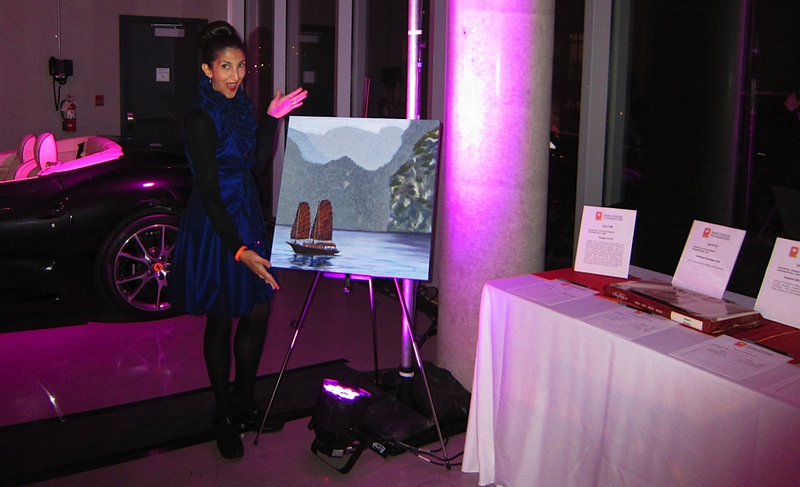 I was very sad to see my Dragon Pearls painting go, but pleased that it helped raise some money for a very good cause. Top Vancouver chefs competed in a sort of friendly iron chef scenario at the top floor of the Ferrari Maserati showroom (see the Ferrari behind me?) and the food was truly superb! One of my favorites, the Pulled Yak Mini Taco – Organic Tibetan Yak Raised in Merritt, BC, Braised in Chocolate Porter, by Louis Simard from Fairmont Hotel Vancouver won runner-up. My other favorites included a prawn galette and a white chocolate passionfruit truffle. However, there was also a duck with candied pistachios and persimmon and chicken on mixed slaw that were truly outstanding. Did I mention the frothy leek and chanterelle soup with foie gras marshmallows? Rare Finds was able to surpass its target to raise over $115,000 at this year’s event. Most of these funds will be distributed within three weeks of the event to awardees in their current microgrant competition and immediately begin giving hope and help to children suffering with rare diseases.